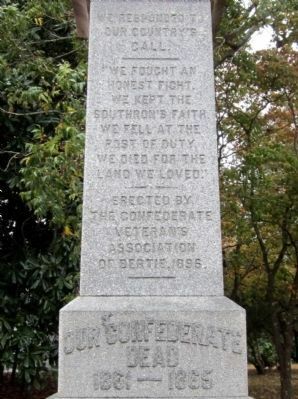 Erected 1896 by Confederate Veteran's Association of Bertie. Location. 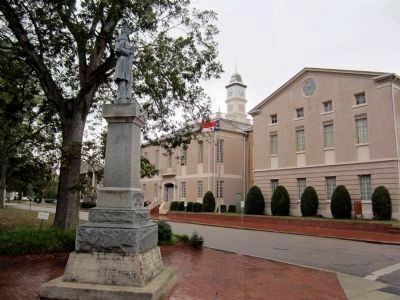 35° 59.828′ N, 76° 56.736′ W. Marker is in Windsor, North Carolina, in Bertie County. Marker is at the intersection of South King Street (State Highway 308) and Dundee Street, on the left when traveling north on South King Street. Touch for map. Marker is in this post office area: Windsor NC 27983, United States of America. Touch for directions. (approx. 0.3 miles away); Roanoke/Cashie River Center Grave Site (approx. 0.4 miles away); Engagement at Windsor (approx. 0.4 miles away). Touch for a list and map of all markers in Windsor. More. 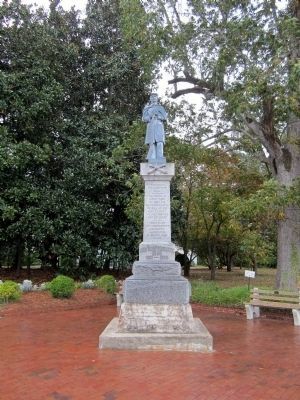 Search the internet for Bertie County Confederate Monument. Credits. This page was last revised on June 16, 2016. This page originally submitted on October 30, 2012, by Bernard Fisher of Mechanicsville, Virginia. This page has been viewed 409 times since then and 8 times this year. Photos: 1, 2, 3. submitted on October 30, 2012, by Bernard Fisher of Mechanicsville, Virginia.